The aim of the Kirstenhof Primary School Aftercare is to provide a safe, nurturing, fun and structured atmosphere for a limited number of children in our care. Our Aftercare staff members have many years of experience in aftercare supervision. 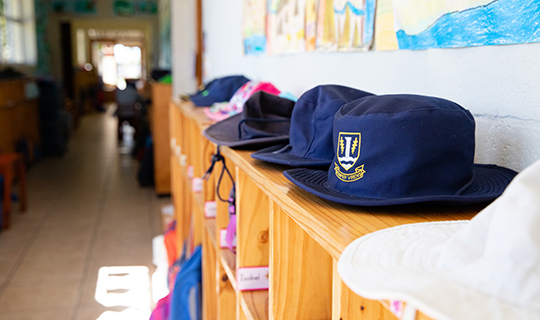 Parents can request an enrolment form from aftercare@kirstenhofprimary.co.za, which you need to complete and return to us with all necessary details. Your child may only attend aftercare on acceptance of the enrolment form and provided we have space available. We have set rules which we insist on being adhered to for the safety and security of your child as well as the smooth running of the aftercare. Space is limited to ensure adequately supervised care. Our aftercare also provides a casual service to those children who need to wait at school before their extra-mural begins. The 2019 casual aftercare daily rate is R40 payable immediately. Casual aftercare use is limited to two days per week per child. Monday to Friday throughout the school terms. Space available for 15 learners only. 13h15-18h00 Monday to Friday throughout the school terms. Closing time is strictly 17h45. On days when the school closes early, we will accommodate all grades. Aftercare starts on the first day of school in January and runs through until the last school day in December. On arrival at aftercare the child’s name is entered on the register. Children are encouraged to eat their snack (snack to be sent with child from home) before they start their homework. Free play indoors or outdoors will be the child’s own choice as our staff are stationed in and outside during the entire afternoon. Wearing of play clothes in the afternoon is compulsory. We have books, puzzles, Lego, colouring books, board games etc. for indoor play. We also have a television and DVD/video player for those wet, cold days when the children are unable to play outside. Completion of homework is monitored on a daily basis in a separate classroom and is fully supervised from 13h15 to 17h30. Our aftercare teachers assist the children in getting to their respective extra-mural activities in the afternoon. Juice and biscuits are also provided daily.